Probably the biggest surprise is the rivalry matchup sitting in the 2 and 3 seeds currently. Both Indiana and New York were expected to be in the playoff hunt, but not sitting right behind Miami with a legitimate chance to win the East. The Atlanta Hawks can also be thrown into this surprise group, as they are right behind the Pacers and not far behind the east leading Heat. It’s going to be an exciting run to finish the season and snagging Indiana Pacers tickets for one of the final games, as they renew their historic rivalry with the Knicks, can lead to an exciting and memorable experience. All eight teams have winning records and the top four teams all have a real chance to win the conference. The biggest surprise found in the western conference has to do with the team not in the playoff picture, as of right now. The 15-20 Los Angeles Lakers were picked to possibly win more games than any other NBA team in history, at the beginning of the season, but they currently sit 10 games back from the 8th and final playoff seed. Another huge surprise lurking even further back than the Lakers is the Dallas Mavericks. Both of these teams have recently experienced quite a bit of success, but neither is even close to the playoff hunt right now. Without a long winning streak in the second half of the season, we may see the Lakers miss the playoffs for only the 6th time in franchise history and the first time since 2004-2005. We will most likely also see the playoffs played without Dallas for the first time since the 1999-2000 seasons. With the two biggest surprises coming from the west, predicting the NBA finals teams isn’t all that easy. At the beginning of the year, many experts picked Miami and Los Angeles Lakers to make the finals. However, it’s necessary to re-evaluate the picture now and it’s very likely a team, such as the Indiana Pacers or the New York Knicks could build enough momentum to overtake Miami in the playoffs. The west is all up for grabs and the most likely team to go to the finals is the San Antonio Spurs, simply because they know how to get there. Another team to look out for is the Oklahoma City Thunder, as they are young and capable of making a playoff run. Whichever teams end up in the playoffs and the finals, this season has created quite a bit of excitement. The top teams in both conferences are only a few games apart from each other and nobody is running away with the conference titles. It will be exciting to watch and fun to see how it all shakes out. With the news that David West plans to test free agency once a new CBA is finalized (whenever that is), the Hornets have two choices: 1) let him walk and further hurt their chances of re-signing Chris Paul, or 2) overpay to keep West. Let’s assume they do the pragmatic thing and let him walk. At that point, the franchise needs to take the long-term view and try to rebuild. Paul will most likely leave at the end of the season, so the Hornets should try to get as much as they can while they can, or else they’ll end up like the Cavs or the Raptors, watching their star walk away with very little to show for it. With that in mind, here are five semi-reasonable trade offers for Chris Paul. I use the phrase ‘semi-reasonable’ because New Orleans fans need to keep their expectations in check — teams are never able to get equal value for their disgruntled/one-foot-out-the-door stars. 1. Thunder trade Russell Westbrook, Cole Aldrich, Thabo Sefolosha and Nate Robinson for CP3. See this trade in the ESPN Trade Machine. The key to this trade is obviously Westbrook — a young All-Star who has proven that he’s not ready to lead the Thunder, who could absolutely take over the Western Conference if they could get heady, consistent point guard play. Westbrook is only 22, and could eventually develop into a top tier point guard, but right now he doesn’t know how to run a team. He turns the ball over way too much and his shot selection in crunch time is suspect at best. The Thunder shouldn’t wait for him to develop; with the Lakers and Spurs on the decline and Dirk Nowitzki getting older, the time is now for OKC. On the flip side, the Hornets have the luxury of letting him develop. Who knows, maybe he turns into a top 10 player. Even if he has plateaued, a 22-year-old All-Star is not a bad haul for CP3, who is likely out the door next summer. Aldrich and Sefolosha sweeten the deal a little bit, balance the salaries out, and give the Hornets a couple of young rotation players. As for Paul’s contract situation, call me crazy, but I think he signs a long-term deal given the opportunity to play with Kevin Durant and James Harden. 2. Celtics trade Rajon Rondo, Jeff Green and Nenad Krstic for CP3 and Aaron Gray. See this trade in the ESPN Trade Machine. This is a ‘one last run’ move for the Celtics, who aren’t going to get past the Heat and Bulls with their current lineup. Paul adds a new dimension to the Celtics offense and would be deadly in the pick-and-pop with Kevin Garnett. Plus, he’d give the Celtics a guy to build around once they decide to part ways with KG and Ray Allen, allowing Paul Pierce to fill a more complimentary role. (This assumes that Paul would be willing to re-up with the Celtics.) For the Hornets, they get an All-Star point guard who has had more ups than downs, along with a versatile forward (Green) who has proven he can score 16+ a game. 3. Clippers trade Eric Gordon, Mo Williams and the T-Wolves’ unprotected 2012 first round draft pick for CP3. See this trade in the ESPN Trade Machine. Gordon developed into a 22 ppg scorer in just his third season in the league. Williams is a capable point guard (and former All-Star), but the other key to this trade is the Wolves’ unprotected 2012 first round pick that the Clippers own as part of the Marko Jaric trade. (That’s right, the T-Wolves are still paying for Marko Jaric.) With the direction Minnesota is headed, the pick is likely to be in the top 5, so the Hornets would likely get another player with star potential in the Draft. The Clippers would be able to pair CP3 with Blake Griffin, but the question is would there be enough talent on the roster to convince both players to re-up? Plus, there’s the Donald Sterling Factor. 4. Grizzlies trade Rudy Gay and Mike Conley for CP3. See this trade in the ESPN Trade Machine. The Grizzlies proved that they could win without Gay, but struggled in crunch time because they didn’t have a playmaker on the perimeter. Paul would fit in well with Zach Randolph and Marc Gasol and maybe he’d be able to coax better production out of O.J. Mayo as well. The Hornets would get a very good small forward in Gay (20-6-3, 40% 3PT) along with an improving point guard (Conley) to replace Paul. The problem with this trade is Paul’s willingness to sign a long-term deal. It’s not likely that he’s going to want to stay in Memphis for the next five years. 5. Hawks trade Josh Smith and Jeff Teague for CP3. See this trade in the ESPN Trade Machine. Perhaps Atlanta would need to include a first round pick to sweeten the deal, but Smith is a borderline All-Star (and possibly Atlanta’s best player) and Teague played very well when given the keys in the Playoffs. The Hawks would have one of the best backcourts in the league in Paul and Joe Johnson, and Al Horford is more than capable of hitting jumpers off the pick-and-pop. The Hornets would get a supremely talented power forward to replace David West and Teague could emerge as a starting-caliber point guard in a year or two. In the end, the Hornets probably won’t make a bold trade including Paul, but the longer they wait, the worse off they’ll be. The Nuggets did all right with the Carmelo trade, but it nearly destroyed their season. Do you miss Blake Griffin already? Check out this compilation of all of his dunks from the 2010-11 season. Don’t miss another of Blake’s dunks, get your Clippers tickets now! Lakers and Clippers to oppose Kings move to Anaheim? The New York Daily News reports that a possible move by the Sacramento Kings to Anaheim is likely to be opposed by the two teams already in the L.A. area. The move to Anaheim will be opposed by the Lakers and Clippers, who see it as an encroachment on their territory. But sources close to the Maloofs say they’re willing to pay the two L.A. teams whatever it takes to relocate. That would be in addition to the league’s relocation fee of $30 million. Anaheim Honda Center and Ducks owner Henry Samueli is prepared to help the Maloofs with the financing, offering a $100 million loan. Samueli tried to buy the team last year. I live about six miles from the Honda Center and I’d love to see the Kings play there. I go to about one or two Clippers/Lakers games a year, and I’m thinking about getting season tickets to see the the Anaheim Kings (or whatever they end up calling themselves), so I don’t see the Kings as major competition for the Lakers or Clippers. If either franchise (especially the Clippers) were serious about courting Orange County, they’d move to Anaheim. As it stands, the 45-mile trek into the city (oftentimes during rush hour) is more than most OC folks can handle. Orange County has more than 3.0 million residents, while Los Angeles County boasts 9.8 million residents. The OC’s population is greater than the metro areas of these current NBA cities: Denver (2.5 M), Portland (2.2 M), Sacramento (2.1 M), Cleveland (2.1 M), Orlando (2.1 M), San Antonio (2.1 M), Charlotte (1.7 M), Indianapolis (1.7 M), Milwaukee (1.6 M), Memphis (1.3 M), Oklahoma City (1.2 M), New Orleans (1.2 M) and Salt Lake City (1.1 M). In short, there’s plenty of room for a third team in SoCal, though the best move would be for the Clippers to head south. That isn’t going to happen as long as Donald Sterling is the owner, and he isn’t likely to sell anytime soon, so I don’t blame the Maloofs for trying to capitalize on a move to Anaheim. The Los Angeles Angels of Anaheim (talk about a dumb name for a baseball team) were #5 in average attendance in 2010 and 2009. The Anaheim Ducks have been in the #15-#25 range over the past four seasons. Orange County will support a professional team if it’s good. Southern Californians are notoriously front-running, and will only go out of their way to support a winner. A team that loses like the Kings have this season is unlikely to outdraw Sacramento or Las Vegas, but Anaheim has a respectable arena and the Maloofs are finding that they have a lot of support from Samueli, who owns the Ducks and the Honda Center. So the Clippers and Lakers may oppose the move, and why not? There’s no downside for them. If they put up a stink, they’ll at the very least get some extra cash out of the deal to grease the wheels. But it’s not fair to basketball fans in Orange County, who would like a local team to root for that wouldn’t require an hour-plus white knuckle drive to see in person. It’s nonsensical that a metro area this populous and spread out has two teams sharing an arena when there’s a comparable arena in Anaheim. This ad ran recently in the L.A. Times. Take a good look. On the surface, Clippers owner Donald Sterling was trying to do something nice. 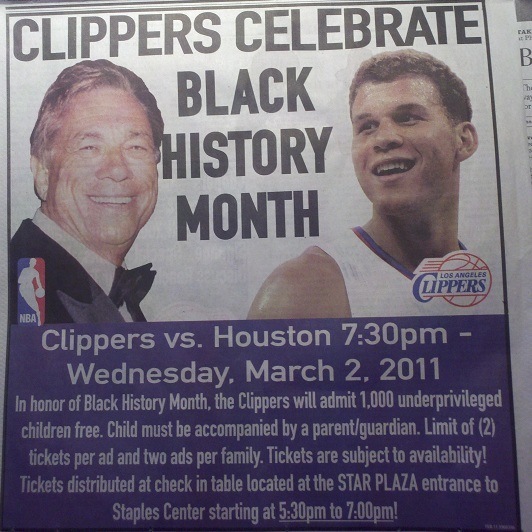 He wanted to admit 1,000 “underprivileged children” free to the Clippers/Rockets game on March 2 in honor of Black History Month. Only Black History Month is in February. Why is he celebrating it in March? And why is he associating “underprivileged kids” with Black History Month in the first place? Is he implying that all “underprivileged kids” are black? And how did the Staples Center employees know if a kid was “underprivileged” or not when he/she showed up for the game? By the color of his skin? If this were any other owner, people would have a chuckle and write it off as poor planning by the team’s public relations department, but Sterling has a long history of racial missteps, from discrimination lawsuits in his real estate ventures to comments he allegedly made in the Clipper locker room. The guy just can’t get out of his own way.